Terrific location, quiet, convenient and great prices too! 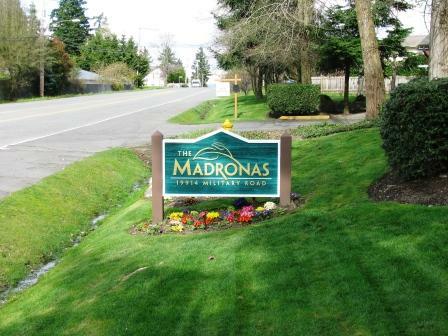 The Madronas is a cozy apartment community featuring spacious 1 and 2 bedroom floor plans. Large kitchens, modern appliances, washer & dryers, spacious bedrooms and lots of windows giving extra natural light. Large living room and dining room, also patios on ground floor - great for BBQ! Covered parking is included as well as additional storage. One mile from Angle Lake with swimming, fishing and picnic shelter. Minutes to highway access and light rail! We currently have a top floor unit available!